I need a vacation to recover from my vacation. I saw museums, a climbed a mountain, saw more museums, walked a lot, ate good food, and shopped, so I basically achieved everything I wanted to in my whirlwind getaway. Montreal is a city on an island, bordered by the St. Lawrence River and Rivière des Prairies, and at the centre of the city is Mont Royal, the namesake for Montreal. Climbing the mountain was day 1, after exploring Rue Ste. Catherine before checking into my hostel. Basically, after that, I was utterly exhausted, having woken up around 5am that morning. Day 2 brought exploring via the Montreal subway system, bringing me to the old city. I loved it. It felt very much like Quebec City, with winding roads, cobblestone, and buildings that have stood for centuries. Norte Dame Basilica – my goodness, it was spectacular. There is a minimal entry fee, and it is completely worth it. It is grandeous, opulent, and simply stunning. While in Vieux Montreal, I visited the Château Ramezay and Pointe-a-Calliere Montreal archaeology and History Complex. Both told the history of Montreal, but using two completely different interpretation perspectives. Chateau Ramezay had its first floor dedicated almost entirely to a timeline of Montreal, and the bottom floor was set up with rooms representative of a New France home. The first floor was also where a special exhibit was installed, War Flowers, an interesting sensory experience, telling the stories of WWI soldiers. Pointe-A-Calliere, however, told the Montreal story though archaeology and artefacts recovered. The museum was essentially built on top of an archaeological site, a which created very interesting gallery space. That afternoon, I found Espace Tricot, a lovely yarn shop a short walk away from a subway stop. Three skeins later, my bank account was a little lighter. I started Day three at the Jean Talon Market, a large farmer’s market near the city’s Little Italy neighbourhood. Afterwards, I wandered around the Notre Dame Des Neiges Cemetery, Canada’s largest cemetery and one of the largest in North America. There are a number of notable internment, but I was apprehensive about asking at the office how to find some of them. At the front gates, there was a large sign, and from what French I understood, it basically enforced that the cemetery was a sacred place for remembering, and I just didn’t want to be *that* tourist walking in asking where to find notable burials. Working for a museum and having an interest in history means I’ve spent more than my fair share of time researching and wandering cemeteries. I was concerned my interest may not have translated, so regardless, I wandered about before a quick lunch break and a tour through Montreal’s Mile End neighbourhood. It is known for being a trendy ‘hipster’ locale, and this is where I sampled a Montreal bagel. It holds up to the hype. A quick visit to the McCord Museum capped off the day. My final day brought me to Montreal’s municipal museum – can you spot a theme? I also found the Maison Tricot, another fantastic yarn shop. I happily bought a skein of Biscotte yarn, notable for being super soft and delightfully self-striping. I tried to take it easy by the last day, having walked far too much in shoes that really shouldn’t have seen that much walking. Long story short, I really enjoyed Montreal, I was very happy staying at HI Montreal, a hostel run by Hostel International Canada, and at a five hour train ride away, it was a great escape from every day life. One last picture – trying to detangle yarn on board the train home. Good thing I had patience! I’m writing this onboard a train headed east to Montreal. March was a hard month, and my vacation/escape has come at an opportune time. I don’t have much planned for this trip, some sightseeing, some eating, and some shopping. Montreal is a new city for me, having only stopped briefly in it over 4 years ago on route to Quebec City. So far on this trip, I’ve read almost an entire book, drank quite a bit of coffee, and have worked a few rounds on a pair of socks destined for my grandfather. I’m hoping to make more of a dent in the leg as the morning progresses. I worked Saturday afternoon, so yesterday was the first true day of my holidays. I spent time getting my house organized and getting myself organized for this get away. 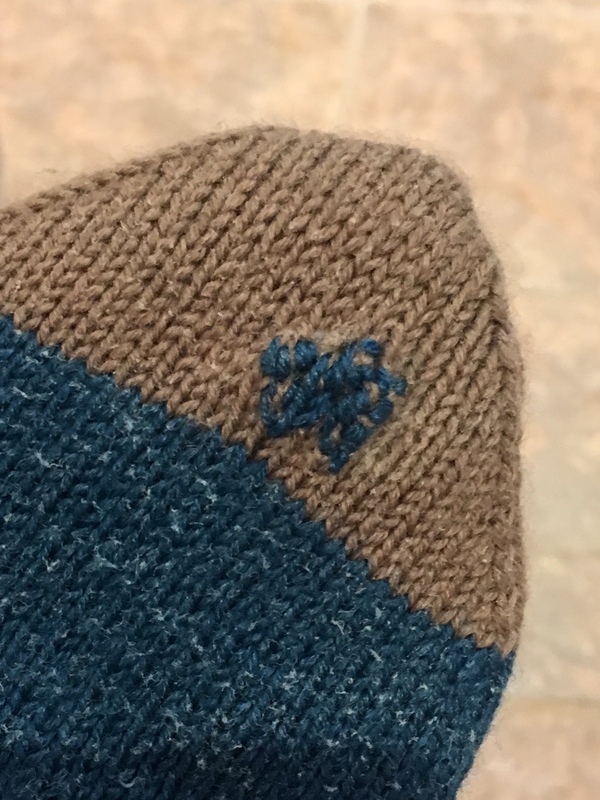 I also took time to repair (albeit poorly) a pair of socks. I’m a little disappointed this pair hasn’t held up; I’m inclined to blame the yarn, but perhaps I was harder on this pair than others? They were a great mindless pair to make, and I was sorry to see the hole starting in the toe. The day earlier, I was at an event, talking about many objects from long ago, one of which was a sock darker. It’s a funny looking, dumbbell shaped wooden object, and it allowed for conversations about handicrafts and quick consumer culture of today (“What happened when you get a hole in your sock?’ I would ask, and inevitably, the answer was, “Throw them out.”) A few guests would say they remember their mothers/grandmothers using something similar to the sock darker example I had, and one guest remarked that they remember a person in their life using an egg when darning. When I settled in to repair the sock, I don’t have a sock darker of my own, but remembered the anecdote about using an egg. Good enough, I thought. 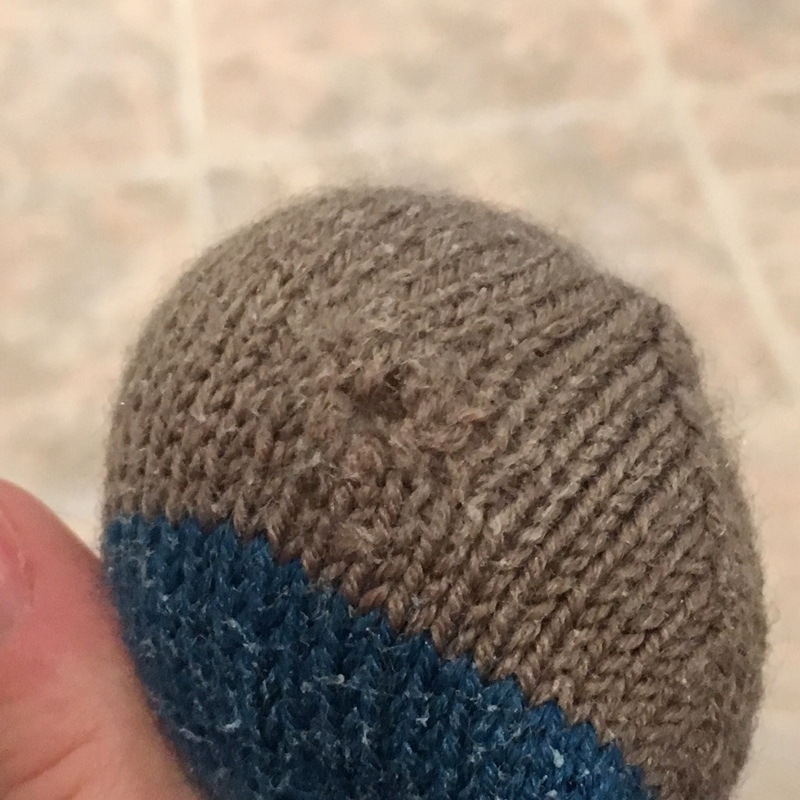 I took the egg, popped it into the toe of the sock and was ready to start darning. 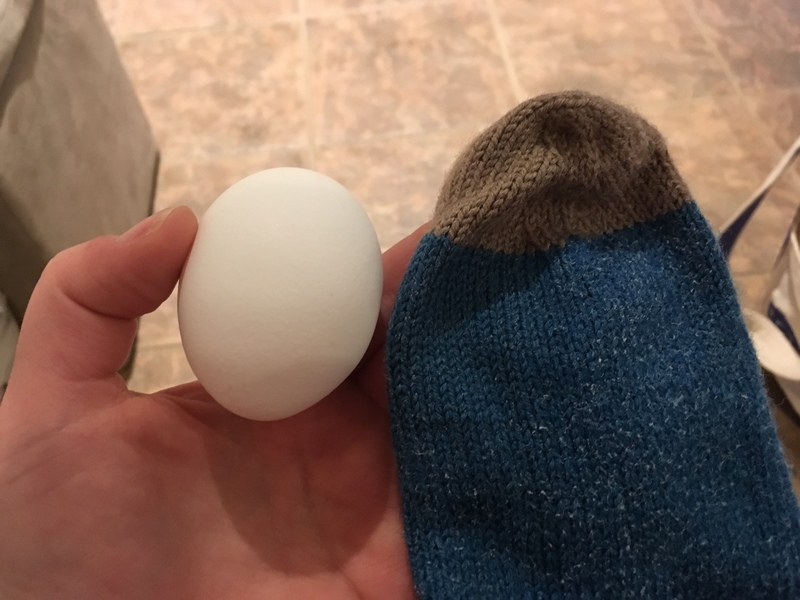 The egg, or sock darker, provides a surface, making it easier for repairs. And here’s where I make my confession: I had no idea what I was doing when I was darning. I watched a few YouTube videos about darning, I had my yarn ready, and I just went for it, aesthetics be, well, darned. I couldn’t find the same colour yarn I used for the toe, but I had quite a bit of the body colour left. While it does stick out very noticibly, I’m rather pleased with the result – it’s almost as if the patch is a visible marker of where I’ve been, of what those socks have been through. Everything is a skill, which can get better with practice. I’ll likely have to darn more socks to get better at this technique (although I hope I don’t have to do this too often – I rather like my sock collection!). For now, the patch job works, and the socks are ready for their next wear. Well, I can say that my Yarn Challenge project is FINISHED! And, I don’t just mean I’ve cast off done. It’s cast off, ends woven in (and that was a test in my patience! ), and blocked done. I’m really happy with this one – pictures to come in the coming weeks. What is that, you ask. That would be the needle tip broken off from the cord. With only a few rows to go. 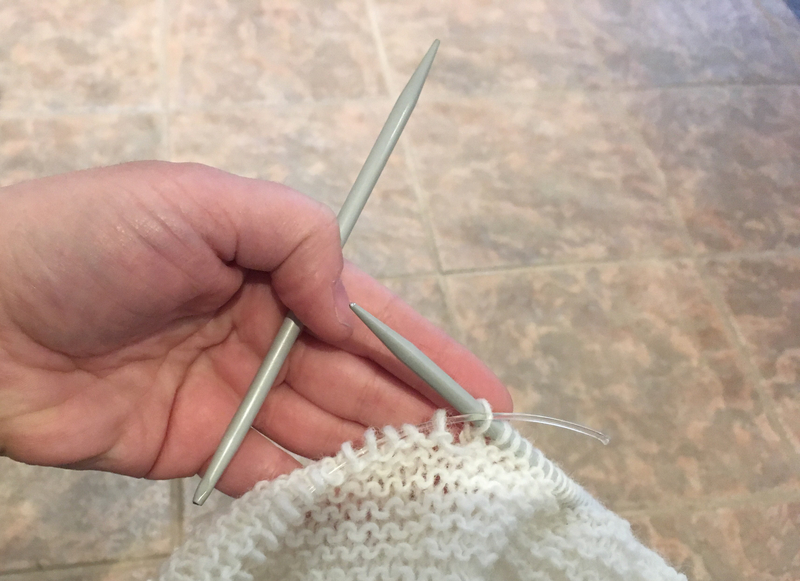 Luckily, I had another 5mm circular needle in my needle stash, so I was able to keep working. I would imagine this is the needle equivalent to dropping your ice cream cone? On the first Thursday of the month, a number of sock-knitting bloggers share their progress with the theme “Once Upon a Sock,” an awesome initiative co-ordinated by Paula @ Spin A Yarn! It’s well worth checking out the other posts because it’s always interesting to see what other people are looking at; it’s like sock yarn eye candy! My knitting this month, admittedly, has been dominated by the Soper Creek 2019 Yarn Challenge project. It’s still super secret until later this month, but I am SO PLEASED with how it’s progressing so far. I have a number of rows to finish and giving it a good bath before I turn my submission into the LYS. Can’t wait to post pictures. But, anyways, in between the super-secret-project, I’ve been working on socks! Last month, I mentioned how my two sock projects on the go were simple vanilla socks. After finishing the purple socks and wanting something new to work on, I wound this beautiful skein Leo and Roxy Yarn Co. 80/20 Sock and started a simple lace sock. See, really simple. I’m working away at the foot and am VERY happy with how it’s progressing. The lace adds interest but is not taking anything away from the yarn, which is doing its own magical thing! If I was to make this pattern again (and, I very well might), I would swap row 4 and 8 of the pattern – the way it’s currently working is that the first instep stitch after turning the heel and picking up for the gusset, is a yarn over, and the first stitch of the heel (when looked at from the RS) was a yarn over as well. By swapping these two rows, the yarn over would always be in the middle of the pattern, not the first stitch somewhere. Things to keep in mind next time. For now, I’m going to keep working away and am looking forward to seeing this pair progress!